1) Preheat the oven to 350°F. Lightly grease the bottoms of two 8″ by 8″ square pans. 2) To make the streusel topping: Whisk together all the dry ingredients, mix in the melted butter, and continue to stir until the mixture forms crumbs. 3) To make the cake: Whisk together the sour cream, oil, and eggs. 4) Add the remaining cake mix, whisking until smooth. 5) Pour half the batter into each of the prepared pans. 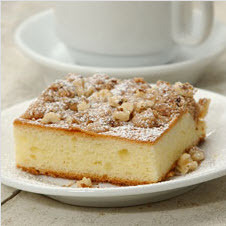 Sprinkle one-fourth of the streusel atop each cake. 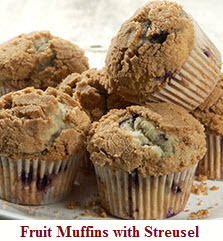 6) Bake for 20 minutes, then sprinkle the remaining streusel over the cakes. 7) Bake an additional 10 to 15 minutes, until cake is brown and the middle is firm to the touch. The internal temperature at the center should be 210°F to 212°F. 8) Remove the cakes from the oven, and let them cool in the pans for 10 minutes. Dust with confectioners’ sugar, if desired, and serve warm. Yield: two 8″ x 8″ cakes. 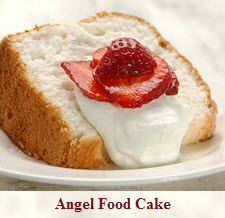 This cake is good at room temperature, but it’s extra delicious served warm. To reheat an individual serving, microwave for 10 to 15 seconds on high. To reheat the whole pan, cover with foil and warm in a 300°F oven for 10 to 15 minutes. To thaw and reheat a frozen cake, cover with foil and warm in a 350°F oven for 25 minutes. For crisper streusel, remove the foil and bake for 5 more minutes.